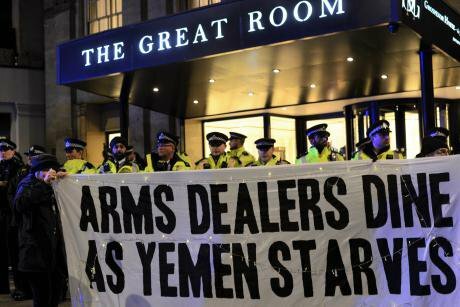 Image: Protest outside last week's Aerospace, Defence, Security and Space annual black tie dinner in London's Park Lane. Credit: Lydia Noon. While Brits have grown accustomed to turbulence in political fairyland, last week the action moved from Whitehall to hotels, and the subject matter has been the UK’s future as cheerleader for free trade.